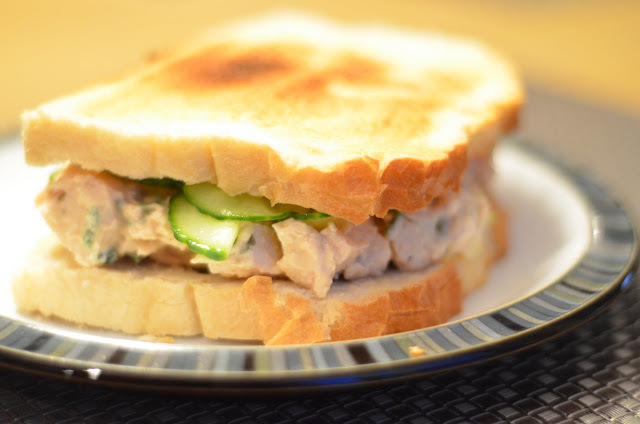 Pair a flavorful chicken salad with the crisp bite of a quick pickled cucumber. Super tasty for a quick weeknight meal! Combine vinegar and sugar in microwave-safe medium bowl and microwave until sugar dissolves, about 90 seconds. Add cucumber slices to bowl and toss to combine. Whisk together mayonnaise, soy sauce, sesame oil, and ginger in a large bowl until combined. Add chicken, scallions, and sesame seeds to bowl with mayonnaise mixture and toss to combine. Season with salt and pepper to taste. Top 4 slices bread with chicken salad, followed by cucumbers, then remaining 4 slices bread.